These photographs first appeared June 13, 2000. Here are some nice photographs from Ron Machtan of Minnetonka, Minnesota, <RonaldoMac@aol.com>. Ron became a two-Whaler owner when he came across an eleven foot hull this spring while shopping for a new trailer for his Classic 1967 Boston Whaler 16 Nauset. As an avid fisherman, he puts quite a few miles on the Nauset, both on the road and on the water. He says, "Everywhere we go we get admiring comments by others at boat landings and on the waterways." 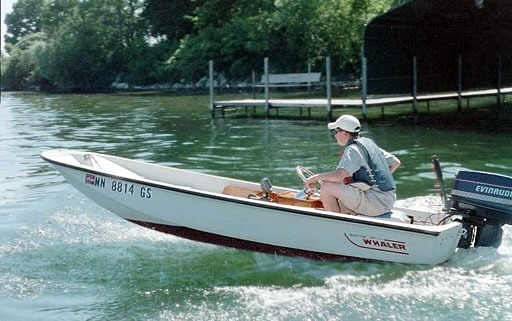 If this Whaler looks a little smaller than usual, that's because it's an eleven footer. 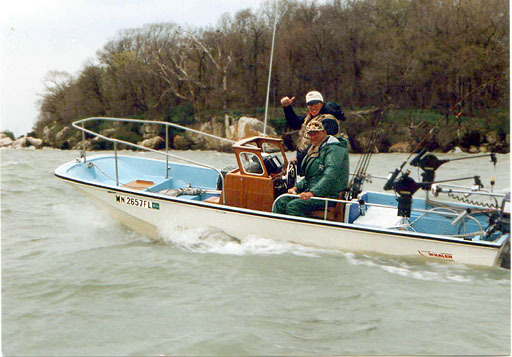 Ron Machtan found this 1989 Whaler 11 Sport, bought it, and made restoration of it a father-son project. You might think this photo shows son Mike having all the fun, but I bet there was a smile on dad's face as he was taking this shot. And how is this for a great deal: Mike gets to use the boat to travel to and from his summer job on Lake Minnetonka as soon as he finishes his safe-boating course. The 20 HP Evinrude gets him up to 25 MPH; that'll make for a speedy trip. Most Whale(r)s are accustomed to feeding on pelagic fish in ocean waters, but the 16-foot hull has especially adapted to fresh water lake fishing, where it prefers the Walleye. 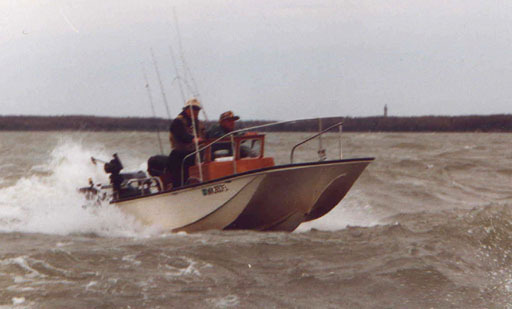 In May, western Lake Erie provides the best fishing for this prized catch, and this 1967 Nauset has developed an annual migration pattern (by trailer) from Minneapolis all the way to Put-In-Bay, Ohio to hunt for them. Ron Machtan bought this well-cared-for 1967 Nauset in 1989. "The owner's wife actually cried when I hitched the trailer and towed the boat away," says Ron. Off went the old 100 HP Johnson and on went a 90 HP Yamaha. "The marina wanted to include the standard Yamaha binacle mount throttle and trim control. I told them if they couldn't find a way to use the original Morse control, I'd find another outboard somewhere else." An 8 HP Yamaha auxillary engine was added in 1997. 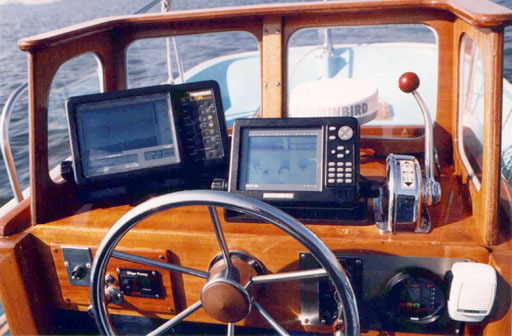 Electronics include Hummingbird 8000 fish finder and NS-10 Mapping GPS. Note the bilge pump switch, the pump having been added to help get water out of the back of the boat in a hurry, as Ron notes: "We fish Lake Erie, Lake Michigan, Lake Superior and Mille Lacs in North Central Minnesota, as well as Lac Suel, in Ontario, Canada." If you've ever taken a picture of waves, you know that they always photograph much smaller than they really were. Applying that factor here means this Classic 16-foot Nauset is out in rough water, furnished at no extra charge by Lake Erie. I believe that's the Perry Monument in the background. And I bet that bilge pump is running right now, too! Please note that there is now a FORUM section for follow-up comments on Cetacea photographs.